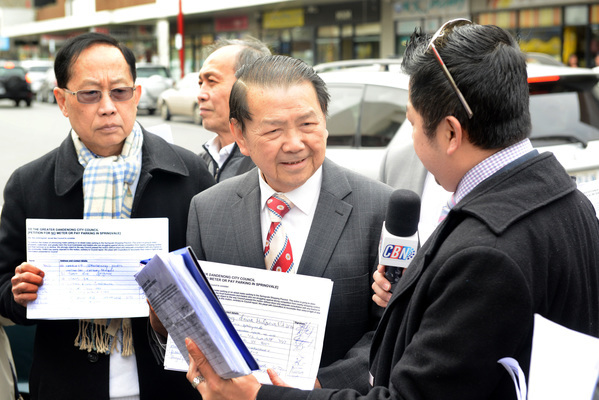 GREATER Dandenong councillor Youhorn Chea says he will try to launch a last-ditch rescission motion to halt an on-street parking meter trial in Springvale. Cr Chea will seek to introduce a second rescission motion on 27 July to scrap the 12-month $470,000 trial which is set to roll out as early as six weeks’ time. A previous rescission motion introduced by Cr Chea was defeated in April and the expenditure was then approved in June’s yearly budget. Mayor and Lightwood Ward colleague Sean O’Reilly, who supports the trial of the $1.20 hourly meters, raised doubts whether Cr Chea’s motion will be allowed. Cr Chea in turn threatened to withdraw electoral support for Cr O’Reilly – a previous running mate – in the 2016 council elections. “I told him already I won’t support any councillor that supports the parking meter fees,” Cr Chea said. Cr O’Reilly said that if the trial works as well as the council thinks, the pro-meters councillors should get “credit for supporting a brave initiative“. He said the trial – coupled with a new early-bird pricing for the underutilised multi-deck No.8 car park – aimed to fix Springvale’s traffic congestion and parking shortage. Car parking was up to 97 per cent full at times, with a third of traffic comprised of drivers circling for a parking spot. Springvale Asian Business Association has collected more than 1000 signatures as part of a petition campaign against the parking meters. Its president Daniel Cheng predicted Lightwood Ward councillors O’Reilly and Loi Truong were committing “electoral suicide” if they continued supporting the trial. Cr Peter Brown has withdrawn his support for the trial and Cr Loi Truong told the Journal he had only supported the trial because it was backed by an overwhelming councillor majority. He said he fought for free drop-off zones “for the people“ as part of the trial.